At Station Square Dental, we offer a range of periodontal treatments to ease the pain, discomfort, and poor oral health that accompanies gum disease. Our dentists assess your mouth for any signs of gum disease during your regular, routine check-ups and cleans, allowing us to treat these concerns before they turn into more worrisome conditions, such as periodontitis. There are many different kinds of bacteria, mucus and other particles in the mouth which stick to the teeth and form plaque. These are usually removed with good oral hygiene habits (such as routine brushing, flossing, and regular trips to the dentist). If plaque is left on the teeth for long periods of time, however, it hardens to form tartar. Tartar is much more difficult to remove, requiring the equipment and skills of a professional dentist. The presence of tartar can cause gum disease in its early stages, known as gingivitis. This occurs when the bacteria in the tartar and plaque have spread to the gums, causing irritation and damage. When gingivitis is left without treatment, it can progress into a much more harmful form of gum disease known as periodontal disease. If you notice any of these signs or symptoms, please schedule an appointment with our oral health care professionals ASAP. With our experienced hygienist on-board, we are experts at treating and preventing gum disease. 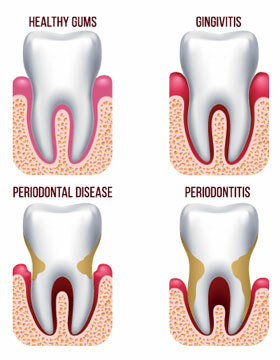 The simplest treatment for periodontal issues includes de-scaling and cleaning the teeth. If gingivitis has become severe and progressed to periodontitis, options include root surface debridement. This involves cleaning the gums and roots of the teeth well below the surface of the gums. De-scaling and root debridement can also be used with antibiotic therapy to treat the very painful symptoms of periodontitis. Prevention and early intervention are vital when it comes to gum disease, so please call (03) 9568 8911 today to schedule an appointment with our experienced dental hygienist.